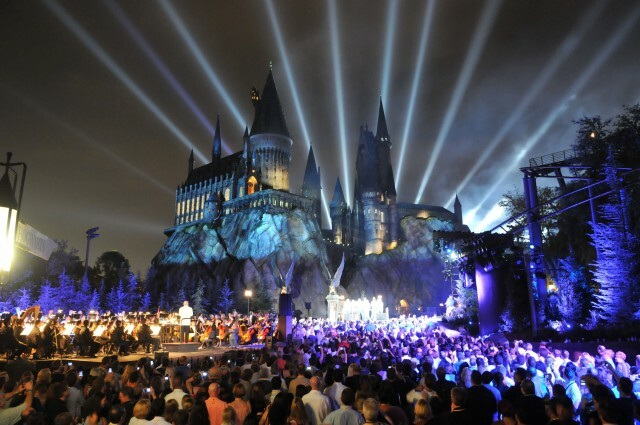 Recently, Universal Orlando celebrated the 1 year anniversary of the grand opening of The Wizarding World of Harry Potter. After years of planning and heavy involvement with author J.K. Rowling herself, on June 18, 2010 Hogsmeade opened it’s gates to muggles for the very first time. Crowds swelled to Islands of Adventure, with at one point on opening day the line to just enter the area reportedly approached 9 hours. However, according to early reviews, Hogwarts did not disappoint. Immediately the entire land, more specifically the Wizarding World’s signature attraction, Harry Potter and the Forbidden Journey got high marks with many theme park enthusiasts labeling it the best theme park ride on the planet. What a bold statement. To say that a ride that has just opened topped the quality of attractions such as Indiana Jones Adventure at Disneyland, Journey to the Center of the Earth at Tokyo DisneySEA, and even Spiderman just across the lake in the same park, is simply stunning, perhaps unbelievable. How could Universal beat Disney at their own game? Surely it had to be all hype. Harry Potter fans create one of the most die-hard franchise communities around, one that rivals the fanbase of the Star Wars series. All this praise simply had to be the euphoria of their beloved franchise finally getting a theme park attraction…right? Whether or not the ride met expectations, there was no doubting one thing, The Wizarding World of Harry Potter was racking in people from across the globe. According to TEA’s annual Global Attendance Report, Universal’s Islands of Adventure theme park attendance sky rocketed a whopping 30% in 2010 from the previous year. With Orlando being a travel destination it’s obvious that a vast majority of these people are first time guests. That means that when they see “Harry Potter” and “Theme Park” in the same sentence, that they would flock to the park despite the fact they were completely unaware of the ride quality. Attendance is no way to judge the quality of this attraction, as guest simply came for the Harry Potter name. Finally, on April 10, 2011, I had the chance to experience the Wizarding World myself. I could finally judge and put the hype to the test. As a huge Disney fanatic, I simply couldn’t imagine the historically inferior Universal Studios to create an attraction that topped the originators. After all, Haunted Mansion, Pirates of the Caribbean, and even modern attractions such as Expedition Everest and Mission Space were some of Disney’s finest creations. How on earth could Universal Studios beat Disney at their own game? It simply isn’t possible. But then…the impossible happened. Does the quality of ‘Harry Potter and the Forbidden Journey’ rival that of Disney attractions? After experiencing the attraction first hand, the answer is undoubtedly, absoulutely…yes. All aspects of the Forbidden Journey blow anything Disney has done in the last 10 years, out of the water. The Forbidden Journey is pure, old-school Disney: a technological marvel, which is completely masked by the thematic and story element. In no press release or commericial or interview did Universal rant about how the mechanical or technology side of the experience unlike some certain Disney additions in recent history (I’m looking at you World of Color). Instead, they focused on how the immersed riders would be in their journey with Harry Potter. And boy was this ride amazing. For a complete and thorough, scene by scene review of Harry Potter and the Forbidden Journey, click here. Nothing compares this experience; the Kuka arm on a constantly moving track, the use of screens and physical sets, the iconic characters, several fluid and innovative effects, all combined to create in my opinion, the greatest ride I have ever experienced, and for many, the best ride on the planet. Is the Wizarding World of Harry Potter a unique moment in theme park history? In short, no. It really isn’t. It’s the first time that we have seen this phenomenon in the 21st century. However, arguably it has happened in the past on numerous occasions. The most recent of which was 1995. Harry Potter is such a massive and successful franchise due to it having entertainment values that bridge generations that bring out the fantasy in all of us; similarly Indiana Jones is a franchise that also appeals to a wide range of ages and brings out the adventure in all of us. When Disneyland introduced the Indiana Jones Adventure: Temple of the Forbidden Eye in 1995, it was in essence the same exact sensation. Indiana Jones ushered in a totally new kind of ride system with so many elaborate effects, and such a well known franchise it was impossible not to rate it as one of the best rides on the planet. When Walt Disney Imagineering debuted Indiana Jones, not only did they use a totally different and unique ride system (the Enhanced Motion Vehicle) but this was completely masked by the brilliant theming and storytelling of the ride. Not to mention the beloved Indiana Jones was also included. Its success was a no brainer. Even my parents vividly remember waiting 6 hours for the attraction as they were such huge fans of franchise and were blown away. Before that, in 1987 once again in Disneyland, Walt Disney Imagineering pulled back the curtain on Star Tours. Based off of the impossibly successful franchise of Star Wars, this once again combined well known characters into a ride experience that used some of the most innovative technology available at the time. Star Tours was the original motion simulator that arguably changed the course of many future theme park attractions by bringing in video as a key aspect in ride technology. When Star Tours first opened, the park was so crowded it remained open for a full 60-hours to accommodate demand to ride the attraction. But as time goes on, new technologies develop, more and more people ride these attractions and the novelty wears off. The same will eventually happen to the Wizarding World of Harry Potter. The significant part about the Wizarding World’s arrival that sets it apart from all of these sensations of the past, is that the Forbidden Journey is the first time we have seen such rave reviews from a non-Disney theme park. Is Universal surpassing Disney in the theme park industry? To say that through one single addition, the entire ranking and balance of power in the theme park industry has completely flipped, is outrageous. However, to say that Universal is quickly gaining on the Walt Disney company in the theme parks? Absolutely. This is in majorly part to 2 things, Disney having a fairly terrible rap-sheet in the last decade and Universal picking up pace. The start of the 21st century seemed to be the beginnig of a huge decline for some Disney fans. In 2001, Disney unveiled Disney’s California Adventure which proved to be the most poorly designed park in Disney’s history (now costing the company $1.1 billion in construction, and plenty of angry guests). Even 3 years prior, the expertly designed Disney’s Animal Kingdom, while a thematic winner, fell short with the lack of attractions. And in 2002, Six Fla…I mean, Disney hit rock bottom with Walt Disney’s Studios Paris. At the same time, in 1999, Universal took a stab at the theme park industry with Universal Orlando Resort’s second gate, Islands of Adventure: arguably the best combination of themed enviornments with mega-coasters on the planet. The park debuted with 3 giant B&M coasters, 6 themed islands, and plenty to do. Included in the park was the spectacular Dueling Dragons dueling B&M Inverted coasters (now named Dragon Challenge), the Incredible Hulk up-hill launch roller coaster, and the #1 dark ride on the planet, The Amazing Adventures of Spiderman. Universal continued to impress across the globe with the introduction of Jurassic Park River Adventure rides, Revenge of the Mummy attractions, and several other note worthy additions. When you chart the quality of themed attractions, it becomes obvious that Universal has been quickly closing the gap with Disney in the last decade . Yet Disney still continues to rule the world with theme parks with more than 100 million visitors at their 11 parks across the globe. Disney has pumped out some power house rides such as Expedition Everest and the new Star Tours attractions, and continue to have some great creations along the way including Radiator Springs Racers, and Mystic Manor at Hong Kong Disneyland. And while the Transformers attraction set to open at both Universal Studios Hollywood and Singapore will no doubt be masterly created, Disney retains the crown as king of theme parks. What does this competition mean for the future? Looking ahead its clear that Disney is in fact going to have done tough competition from Universal. What is for sure is that eqch of these companies are stepping up their game to combat the other. Wizarding World while still may not be drawing Disneyland attendance figures, is certainly taking people off Walt Disney World property and the few miles down the road to Universal Orlando Resort, something the company certainly isn’t use to. At Disney, Magic Kingdom is already constructing their new Fantasy Forest Fantasyland Expansion which will greatly boost the park’s Fantasyland and overall attraction line up with the addition of a Little Mermaid dark ride, and a new 7 Dwarf Mine Cart roller coaster. Disney’s Hollywood Studios and Disneyland just debuted Star Tours and has been a huge hit since opening. What else will the Mouse do to combat the Wizarding neighbors? I predict atleast 1-2 small additions in Epcot along with another grand E-Ticket style ride to Disney’s Animal Kingdom in the next 5 years, but that’s just my bets…. Universal will hopefully continue to ride on their success next year with Transformers: The Ride in Singapore and Hollywood. 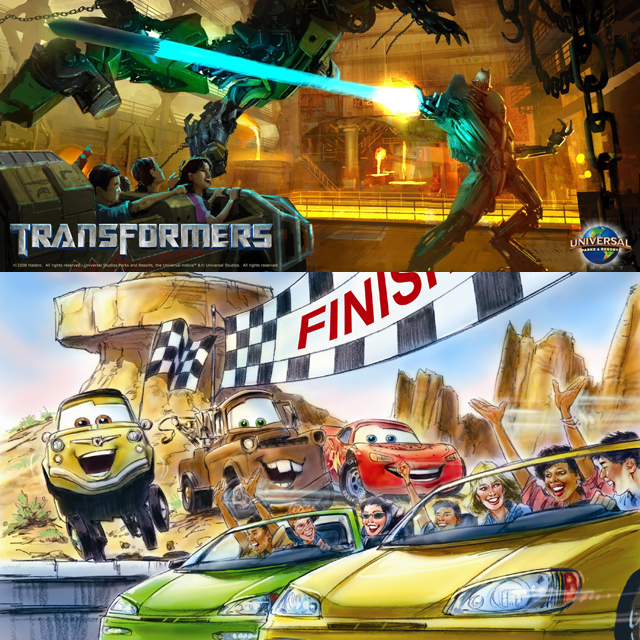 If both of these new additions meet or exceed the quality of Spiderman and The Forbidden Journey, then we could see even more massive attendance boost for the Universal theme parks. 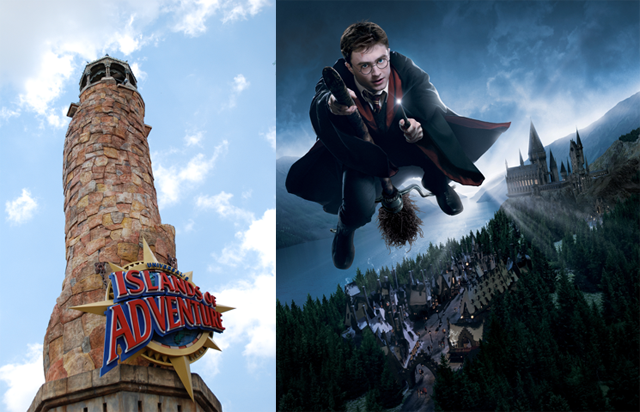 As early as 2013 or 2014, rumors indicate a major expansion to the Wizarding World of Harry Potter in Orlando, which seems like a no brainer after it being a rousing success for the park. Universal Studios Florida will also be adding a family-friendly Despicable Me attraction for 2012. In short, this competition benefits everyone, Wizards and Mice alike. Universal will step up their game (whenever a park can focus and highlight on dark rides, that is an excellent sign) and Disney will start to have to compete to keep the eye on them with all the big name attractions quickly being built at Universal. Both of the park’s design teams, Walt Disney Imagineering and Universal Creative will have their hands full in the next decade pumping out attractions as quickly as possible to top the other. While Universal may have won this battle with the Wizarding World of Harry Potter, we are just now beginning the real war, and one that will hopefully continue for years and years to come. I feel like Universal will sometime surpass Disney’s attractions in quality. They both simply put the most detail into their rides, but Universal just has the little details that makes it scoot forward on the chart in front of Disney. Universal takes it slowly, and adds great rides every couple of years, while Disney adds the same rides to each of their parks every year. Even though Disney gets great rides every year, or even months, doesn’t mean it’s good. Though, Universal adds spectacular rides, that are custom made to suit each park, are fantastic, yet, they don’t rush them like what Disney does. Look at Wizarding World. It took YEARS to plan and build, and they build exactly what they planned on the blueprint. Disney seems like they free draw things that don’t look anything like they do in the rides. They also seem to build faster than Universal, just because. I enjoyed the update Justice! I can’t wait for more updates!